In celebration of Black History Month, Principia’s Black Student Union hosted the Pan-African Conference “Step Up,” a three-day event dedicated to quelling racial tension and building understanding. 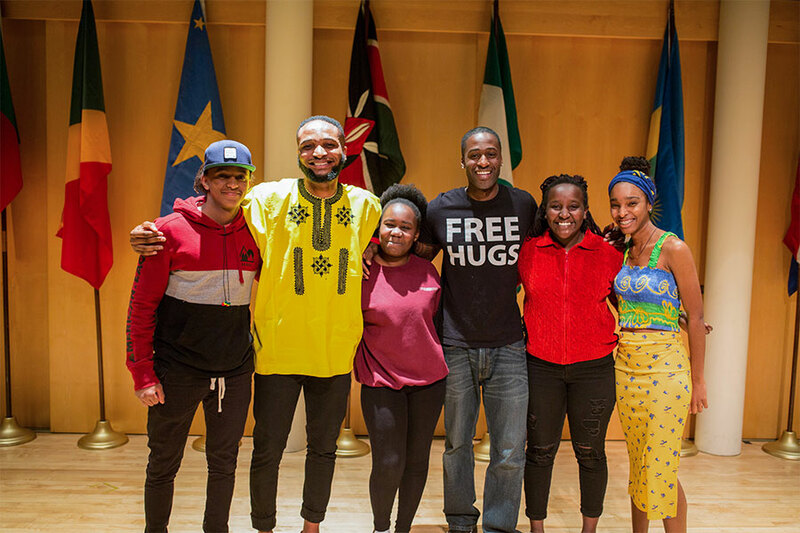 Kenneth E. Nwadike Jr. (above, third from right), the documentary filmmaker, motivational speaker, and peace activist known as the “Free Hugs Guy,” delivered the keynote address. Charles Nwosu (above, second from left), a senior from Nigeria who directed the conference, introduced Nwadike, setting the stage with a proverb in Igbo, one of the most widely spoken languages in West Africa. “Roughly translated into English, the proverb urges the need for love, kindness, humility, mutual understanding, and coexistence,” Charles explained. In his keynote, Nwadike described how training as a runner helped him overcome difficulties growing up in homeless shelters in a racially charged environment in 1990s Los Angeles. He also shared some of his experiences using nonviolence and mutual understanding successfully on the frontlines of political protests, and he described launching Free Hugs Project to help homeless teens. During the Q&A session, Nwadike gave away “Free Hugs” t-shirts, and students took turns getting hugs from him. Other conference events included a poetry slam showcasing students’ work and that of African American poets. Dr. Brad Stock delivered a conference-themed metaphysical talk, highlighting key points in Dr. Martin Luther King Jr.'s last book Where Do We Go from Here: Chaos or Community? Stock emphasized King’s conviction about the inherent dignity of man. He also expounded on Rev. Howard Thurman’s Jesus and the Disinherited and shared a story Thurman heard often from his grandmother, who was born a slave. She told him of secret religious meetings with fellow slaves where a minister told them: “You—you are not slaves. You are God’s children.” Dr. Stock concluded his talk by emphasizing Mary Baker Eddy’s dedication to freeing mankind from slavery of every sort and shared this line from one of her poems: “Love hath one race, one realm, one power” (Poems, p. 22). Conference attendees also viewed the award-winning film Green Book, inspired by the true story of two musicians’ tour of the segregated South in the 1960s and the unexpected bond they develop. Workshop sessions offered opportunities to discuss the film, Dr. King’s books, and the Black Lives Matter campaign, among other topics.